Happy New Year and all the best for a successful operation throughout 2014! There is still a lot of uncertainty in business circles all around Australia, as to what is going to happen during 2014. Unfortunately, we will probably not know the key political decisions of the Abbott government, until the Federal Budget is delivered in May 2014. On the bright side, it appears that the Chinese market will continue to perform strongly and there will be continual growth throughout most of Asia. At its February 2014 meeting, the Reserve Bank decided to keep interest rates at 2.5%, and the general expectations are that interest rates will not go any lower and will start to rise later in the year. The Personal Property Securities Act (PPSA) has become fully operational from the 31st January 2014. Unfortunately, there were very little official promotions or education programs for SME businesses on how the Personal Property Securities Register (PPSR) will operate. This has already proved very costly for some businesses, which have lost out in court cases, mainly against liquidators and receivers. In this issue, we have included two articles on the PPSR. If you are uncertain of what impact could this new legislation make on your business, please contact your commercial solicitor or ourselves, so that a full review can be undertaken of your circumstances, and appropriate system can be developed, to assist you in the decisions that will need to be made on whether to register a security interest on the PPSR. It is interesting to evaluate economists' forecast on what might occur in 2014. In summary, economists are arguing that the government should substantially increase the GST charge to around 18%, as a means of reducing the government's deficit. It will be interesting to see what happens in the May 2014 Budget. As always, cashflow management will be very important. This includes the monitoring of debtors, stock, work in progress and abiding by bank governance on any loans or financing which have been negotiated with banks and other financial institutions. Now is a great time to be preparing business plans and budgets for 2014. If you would like our assistance on any aspect of your business deliberation, please do not hesitate to contact us. Grantor – the party against which that the security interest is registered. Secured Party – the party that holds the security interest. Collateral – the party which is secured by the security interest. PMSI – a Purchase Money Security Interest. The interest secures unpaid purchase price and has a high priority when registered correctly. January and February are great times to look at a business plan for the financial year. Planning a business is fundamental to the business' success. Why not sit down and give yourself an hour to think about your business? The first place to start is to review 2013. What was a success? List the successful items. Now list the activities that didn't go as well as you hoped they would. What did you learn from the successes and the unsuccessful items? Have you reviewed your market? It is the same as what it was in 2013? Do you need to move or expand to a different location? Are your market demographics changing? Do you understand who your potential customers are? What feedback have you received from your customers? Are you happy with your customers? Have you asked your customers about the service your business is providing? What do your team members think? Have you had a 'think tank' meeting with them to examine the results from 2013? What worked and what didn't and what do you envisage implementing in 2014. Have you developed a social media strategy? Are you using it effectively? If you need assistance on the development of business plans for your business, please do not hesitate to contact us. Research and Development – Registration is required by 30 April 2014. An extra tax rebate is available for a company that incurred more than $20,000 on Research and Development activities for the year ended 30 June 2013. If you wish to claim the rebate, you must register with AusIndustry prior to the 30 April 2014 or the date of lodgement of the company's income tax return, whichever is the earlier. If you are conducting ongoing Research and Development activities, you still have to register by the 30 April each year. The Research and Development Tax Rebate for companies with turnovers under $20M is 45% of the eligible research and development expenditure which can include salaries of team members who have been legitimately engaged in research and development project activities. If the company is trading at a loss, you can be paid the Research and Development Tax Rebate as a cash amount within 30 days of lodgement of the company's income tax return. If you would like assistance, relative to completing the Research and Development Application Form and lodgement with AusIndustry, please do not hesitate to contact us. The Personal Property Securities Act (PPSA) became fully operational from the 31st January 2014. This means that the Personal Property Securities Register (PPSR) is now fully operational. The PPSA allows a 'security interest' in personal property to be registered and searched by anyone at any time. 'Personal property' applies to everything, except land and buildings. Whilst there is no compulsion to register any asset with the PPSR, if you don't register assets to which the legislation has deemed a requirement, you could end up losing those assets (even though you paid for those assets) to someone else who has a superior claim to you, because they have registered in accordance with the PPSA. That business will then be lawfully able to sell the asset for which you have paid and utilise proceeds, as contribution towards payments to secured creditors. Virtually every business will be affected by this legislation. If you have not seen your commercial solicitor for advice on your 'Terms of Trade' and the 'Retention of Title' clauses ('Romalpa Clauses') included within your tax invoices, there is a strong possibility that you are not complying with the PPSA legislation. As your accountants, we are able to assist you in implementing appropriate systems for the management of transactions that should be considered for registering the security interests on the PPSR. There have been major legal decisions, which have cost people, who thought they owned the assets but had not registered on the PPSR during the two-year transitional period. To their utmost dismay, they have found that the law didn't recognise their ownership. In the case of WOW Sight & Sound, the business went into financial difficulties and many of the suppliers, who had supplied stock and consignment stock to WOW Sight & Sound stores, did not register their interest in the stock they supplied with the Personal Property Securities Register. The liquidator was able to register the stock items that were in the premises at the time of their appointment, thus the 'owners' of the stock did not have a priority. As a result, the suppliers lost a large amount of money. In the QES case, QES placed plant and equipment on someone else's property, which went into liquidation. QES did not register their security interest on the PPSR, and the liquidator was able to claim that plant and equipment, and sell it for the benefit of the secured creditor. In the Kentor Minerals case, a business supplied a tank worth $300,000 to Kentor Minerals, which then went into liquidation. The owner of the tank did not register their security interest on the PPSR, and they were unable to claim a priority on the tank. The liquidator was able to sell the tank for the benefit of the secured creditor. This legislation is very important; if you have any questions as to how the legislation operations might affect your business, please do not hesitate to contact us. • another potential problem is preferential payments that may have been paid to your business. To protect yourself, you will need to seek legal advice on your Terms of Trade documents and the lodgement of a security interest on the PPSR. • equipment renters – registration of security interest. • dealing with your business' intellectual property. The PPSA represents a very large change in commercial law, with some people claiming it is the biggest change in the last 200 years. If you have any concerns on your business transactions and how they might relate to the PPSA legislation, our recommendation is that you consult your commercial solicitor for advice on Retention of Title clauses and Terms and Conditions of Trade. Please contact us for a discussion relative to the implementation of an appropriate system, for the PPSR, for your business. 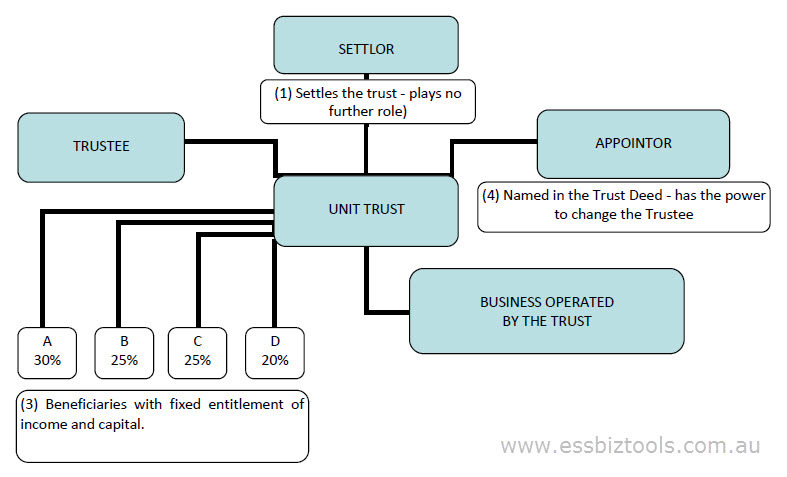 A 'unit trust' is different to a discretionary trust (refer Issue 98 – December 2013). Many small business operators use unit trusts for their business operations. In a unit trust, a beneficiary has a fixed interest with a designated number of units similar to a partnership. The beneficiary is called a 'unit holder', and is entitled to a distribution of income, in accordance with the percentage of units held in the unit trust. It is not unusual in a unit trust for there to have been a payment made for units allocated. A unit trust is normally used when there is more than one family or group of people involved in a business operation. The unit trust needs a trustee. A trustee can be a company or, at least, two individuals. The trustee is responsible for all day to day activities of the trust. The activities of the trust are governed by the trust deed. A 'discretionary trust' is maintained by the trustee. This records the name, address and number of units owned by each unit holder. A unit trust can operate virtually any type of business. In normal circumstances the unit trust does not pay income tax. The trustee must ensure there has been a distribution of the taxable income to the unit holders, in accordance with the percentage they hold in the unit trust. If the trustee does not make a distribution, then the trust has to pay income tax at the penalty rate of 46.5%. If you have any questions on any aspect of the operations of a unit trust, please do not hesitate to contact us.